Ecologically respectful, contemporary-yet-classic in style, Sanctuary Gorilla Forest Camp blends in sensitively with the dramatic African mountain landscape and, situated uniquely inside the national park, you are only minutes away from the start of your gorilla trekking adventure. 2018 sees Sanctuary Retreats relaunch this extraordinary escape after completion of an extensive and tasteful refurbishment programme in the past months, and we are thrilled to share the images from our recent photo shoot with you. 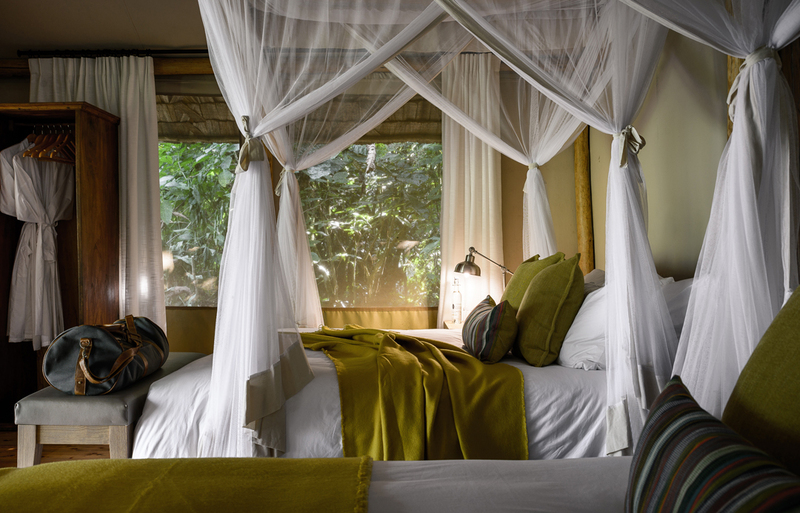 Sanctuary Gorilla Forest Camp’s unique interpretation of camp living offers unrivalled seclusion and space in the ancient rainforest in one of Africa’s most remarkable landscapes. 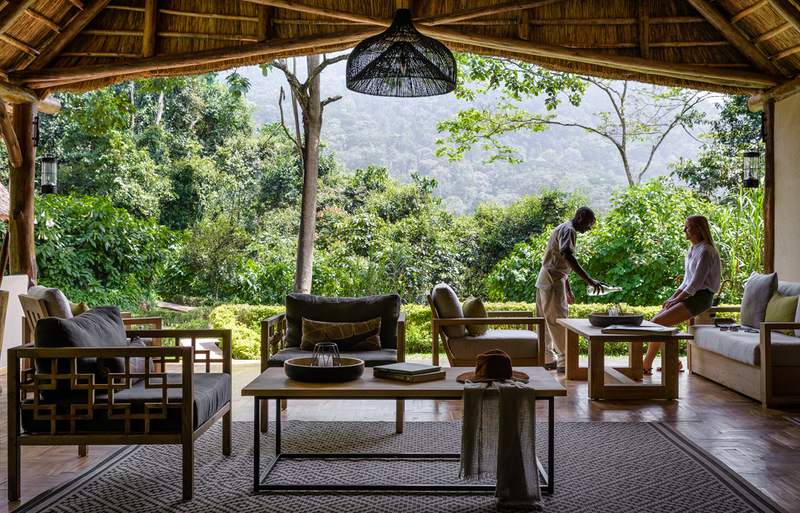 Located in one of the remotest areas of Africa, these comfortable canvas spaces are dressed with indigenous prints and furniture made from natural materials. Beds are draped in neutral-toned linens, and local artefacts set a scene that ensures memorable moments both inside and out the accommodation. Each tent has a spacious, stone-walled bathroom with private sections, and a free-standing bath for a relaxing soak after a day’s trekking. The trees around the camp light up in the morning when the sun starts shining, and thanks to there being so few tents, the camp retains an intimate, exclusive feel, enabling you to experience Africa’s magic with the lightest of footprints yet with practically every mod con. Sanctuary Gorilla Forest Camp’s communal area stars a comfortable lounge with a well-stocked bar and elegant dining area, bestowing great views over the verdant rainforest. Come dusk, under star-strewn skies, and accompanied by the night-chorus, guests gather around the central campfire and swap stories of that day’s adventures. Mealtimes lend a taste of the destination: expertly prepared dishes promise simple flavours and showcase fresh local ingredients — try traditional smoked beef in peanut sauce served with Kalo (millet bread). Candlelit alfresco dining is also available on your tent’s private deck. Quiet and peaceful, even the small spa breathes the spirit of the forest. 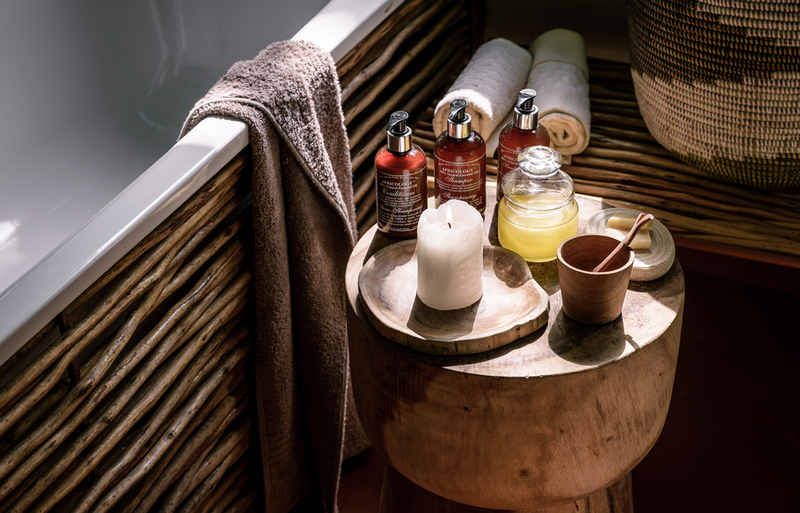 Treatments by the specialist therapist, Precious, include herbal massages, hydrating facials, foot massages and manicures, and we use luxury, eco-friendly products created with pure natural ingredients. There are also yoga kits in all the tents. - New thatched roof, wooden floors, furniture and art for the communal areas in a contemporary design. - Full refurbishment and redecoration of the guest tents, including new tiled roofs and stylish soft furnishings. - Refurbishment and redecoration of all the bathrooms, including all-new fittings. - New electrical geysers to provide hot water for your relaxing baths. - New reception area, stylish camp boutique and camp office, providing you with the warmest of welcomes. - Brand new kitchen and serving area to allow the chefs to create the most sumptuous cuisine for you. - Refurbishment of other back-of-house functions to ensure the best services for guests. 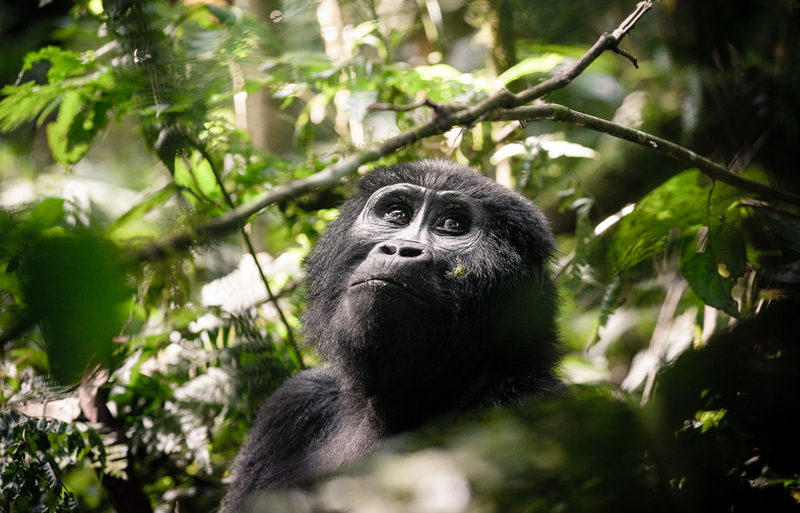 Committed to supporting the local community and preserving the heritage of this history-rich area, Sanctuary Gorilla Forest Camp is a loyal servant to the nature and culture of Bwindi. 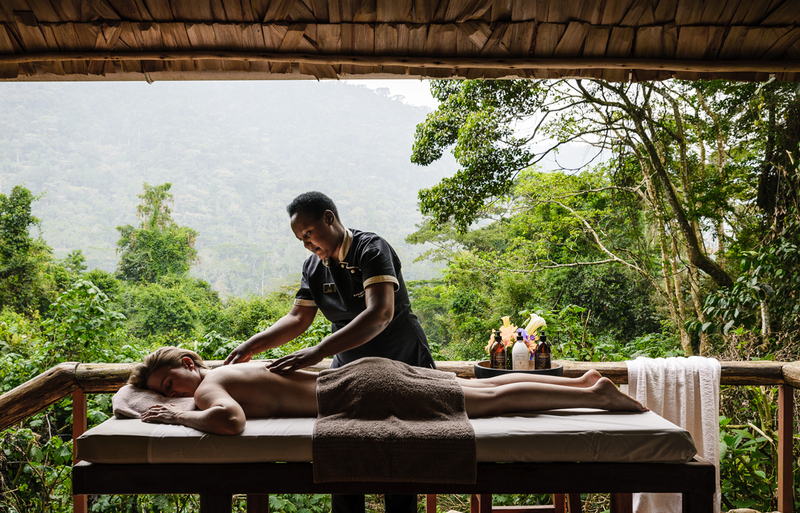 Ninety per cent of the team comes from the communities around Bwindi, they are trained and given permanent employment, and the lodge sources supplies locally. 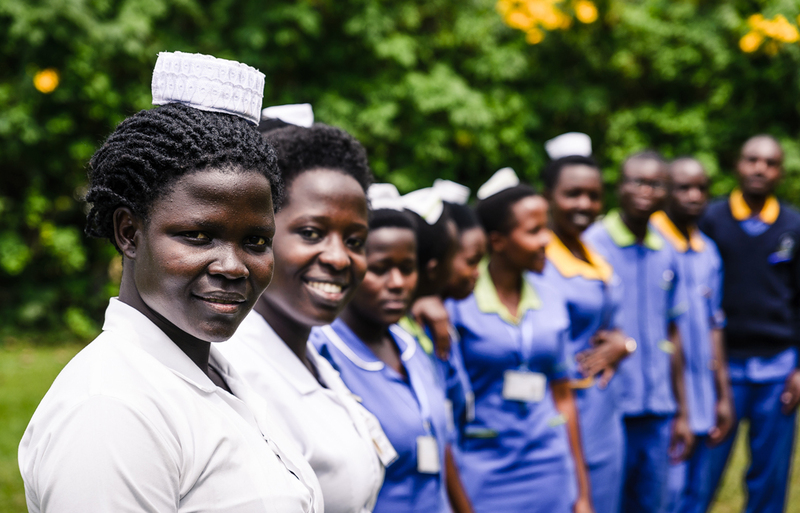 At the heart of the camp’s philanthropy initiatives is involvement in various projects — the camp supports Bwindi Community Hospital, and Ebenezer Nursery and Primary School, and has initiated the Bwindi Women Bike Enterprise. The bicycles can also be hired by tourists who want to take a community tour or would like to explore the area in a more adventurous way. Africa’s greatest wildlife adventures await — you’re only ever one of eight trekkers, accompanied by a Uganda Wildlife Ranger and a porter for each guest, who carries all your belongings while you’re exploring. While the gorillas are undoubtedly the headline act of these lands, rare other animals live in these forests too, such as giant wild hogs and multiple primates, including the blue monkey and the black and white colobus, as well as some of the rarest birds, which offer an exciting alternative to Africa’s traditional safari Big Five. 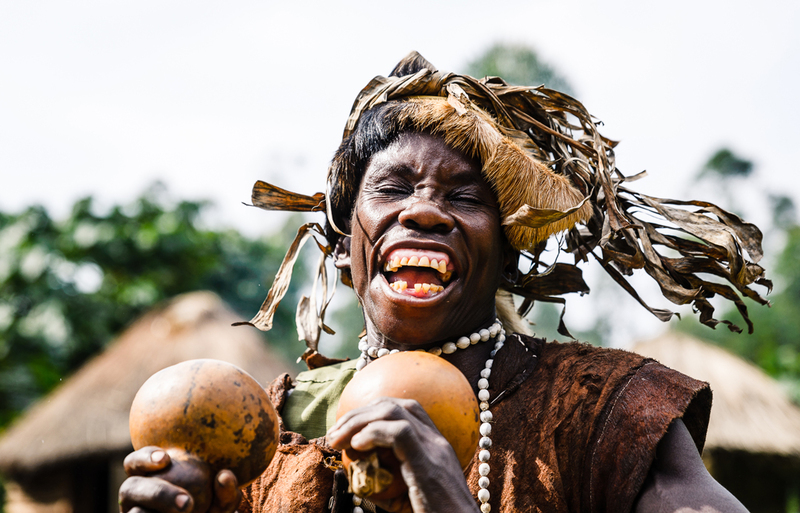 The Batwa people are the oldest inhabitants of the Great Lakes region of Central Africa. More than 4,000 years ago the Egyptians described them as short-statured people living near the ‘Mountains of the Moon’, extolling their skills as dancers and storytellers. It’s a privilege to be in an audience for their musical goddess-visitation-inspired performances, and witnessing a traditional hunting and gathering demonstration. With a focus on cultural exchange, this opportunity is as much about giving back as it is learning. Sanctuary Gorilla Forest Camp was reborn in early 2018. For more information, or to book, please contact us. For more images from the shoot please visit our image library.